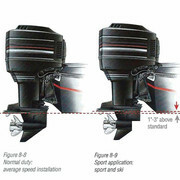 my outboard sits like picture one shows and has the effect of the video when speed is raised, what do i need to do? Anybody have any pictures of what they did? It seems to be mariner & yam 2 strokes were slightly over long, the longshaft measures 22" and the short as you've found about 17". 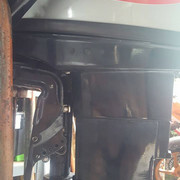 Synchro did you experience this on the Aerotec that failed... a recent new SIB... or another boat completely? 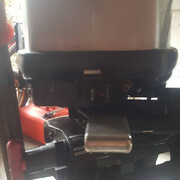 This was on the Aerotec that failed my friend, i am just looking to gain as much information as possible, so i can make sure everything is done just right, to prolong the life of my Honwave. 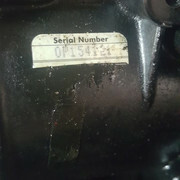 Ahh OK a very common issue fairly specific to the Aerotec. Just use the Honwave as supplied and it could well be OK. I got my mariner 25 from an RYA instructor, who said he got it from SBS surplus, check out the pictures, the holes where drilled into the case for the external control setup, the guy i got it from had converted it to tiller himself and plugged the holes with tight rubber bungs, the shaft is longer than stock 15 inch its more 17.5 and sure when you open the power the water rushes over the transom. Also what is the anodized red part for in the middle picture? I will for sure test the Boat when it arrives, i paid 999 for the t38 from Gillingham Marina ( there RRP price) and i didnt fancy the whole extended transom wheel idea at all or drilling the transom at all so i ended up buying a launching trolley, was 77 on ebay. Thank you ever so much i will try run the outboard on the Honwave stock placement first and then raise the outboard as you describe. I will test everything and report back once my T38 arrives and i have given everything a good run over. Thank you ever so much for helping me out. A great forum for newbies like myself.